There are now two studies into the cost of railway electrification. The Department of Transport has commissioned Professor Andrew McNaughton. The Railway Industry Association have launched an Electrification Cost Challenge. Both arudies expected to be completed in October. The article gives some examples of electrification costs per single track kilometre (stkm). Northern England – Below £2million/stkm. The article finishes with these words. £1million/stkm would be a feasible target. That the Department for Transport has commissioned the independent review suggests electrification could still be on the agenda. Roger is very much a respected commentator and his conclusions are more likely to be spot on, than wide of the mark. Does Running Electric Trains On A Route Count As Electrification? I ask this question deliberately, as over the last few years several schemes have been proposed to electrify perhaps two miles of line to a new development or city or town centre. The Midland Metro is being extended to Wolverhampton station by building a tram line, that will be run using battery power on the existing trams. Another example of this type of line is the extension of the Gospel Oak to Barking Line to Barking Riverside. After reading all the documentation, I have found that electric trains are mentioned several times, but electrification is not. As Bombardier Aventras probably can run on battery power, does this mean that the extension will be built without wires? There are also some electrified branch lines, where the overhead electrification is unadulterated crap. Could we see the electrification on these branches removed to save on replacement and maintenance costs and the trains replaced by battery trains charged on the electrified main lines? I think various developments of recent years will help in the containing of electrification costs. It is my belief that batteries on trains could revolutionise the approach to electrification. In my view, batteries are the only way to handle regenerative braking, which cuts energy costs. This means, that if no trains using a route, return their braking energy through the electrification, then costs are saved by using simpler transformers. Adequate battery capacity also gives other advantages. Bombardier are fitting remote wake-up to Aventras. I wrote about this in Do Bombardier Aventras Have Remote Wake-Up? Depots and sidings can be built with only limited electrification. Hitachi use batteries charged by regenerative braking to provide hotel power for Class 800 trains. Batteries are a simple way of moving trains in a Last Mile application on perhaps a short branch line. Battery power can be used to rescue a train, when the electrification fails. Reports exist of Alstom, Bombardier, CAF, Hitachi, Siemens and Stadler using or researching the use of batteries in trains. I am becoming more enthusiastic about hydrogen power, which is primarily being developed by Alstom. The UK could produce a lot of hydrogen easily from electrolysis of either brine to produce chlorine or water to produce hydrogen and oxygen. Wind power would be a convenient way to provide the electricity needed. Alstom are starting a project at Widnes to convert redundant Class 321 trains to hydrogen power. A hydrogen powered Class 321 train would appear to be a powerful concept. The trains will still be able to run on electrification. The trains make extensive use of batteries. Alstom quote ranges of several hundred kilometres. It would appear that the trains will still be capable of 100 mph after conversion. Class 321 trains can be updated with quality interiors. I believe these trains could find a solid market extending electrified routes. The Class 769 trains have been a long time coming, but companies have ordered 35 of these bi-mode upgrades of Class 319 trains. They will be able to use 25 KVAC overhead or 750 VDC third rail electrification. They have been designed with a powerful hill-climbing capability. Looking at the orders,some need the hill-climbing capability and GWR’s proposal to use the trains on the dual-voltage Reading-Gatwick route is a sensible one. I think that this train and others like it will be the future for many rail routes in the UK and around the world. I will use the Midland Main Line as an example of the use of this type of train. In a few years time, this important route will have the following characteristics. A high proportion of 125 mph running. Possibly, electrification between Sheffield and Clay Cross courtesy of High Speed Two. Full electrification would be difficult as part of the route is through a World Heritage Site. But Bombardier’s train would swap power source intelligently as it powered its way along at 125 mph. This version of Greater Anglia’s Class 755 train, has been ordered for the South Wales Metro. It can run on the following power sources. An intelligent control system will select the best power source. With a central power pack between passenger cars, the design of this train is slightly quirky. It is a 100 mph train with lots of acceleration. I’m sure it could be equipped for 750 VDC electrification. The power pack can be configured for different operators and types of routes. Stadler are quite happy to sell small fleets of trains into niche markets. It is a member of the successful Flirt family of trains, which are selling all over the world. I wouldn’t be surprised to see more of these trains sold to the UK. Hitachi’s Class 800 trains are already running on the Great Western Railway. They have an operating speed of 125 mph on both electricity and diesel. TransPennine Express have ordered nineteen Class 802 trains. Hull Trains have ordered five Class 802 trains. I have gone from London to Swansea and back in a day in Class 800 trains and they the new trains seem to be perfirming well. They will get even better, as electrification is extended to Cardiff. In the previous sub-sections I have talked about four new bi-mode trains, that can run using electrification and under their own power. The designs are different, but they have common features. An operating speed of at least 100 mph on electrified lines. 90 mph-plus operating speed, when independently powered. An out-and-back range of at least 200 miles away from electrification. Proven designs from large families of trains. Only one new route for these trains has been fully disclosed and that is Greater Anglia’s new Liverpool Street-Lowestoft service. There will be three round trips a day between Lowestoft and London, using Class 755 trains. North of Ipswich, diesel power will be used. South of Ipswich, electric power will be used and trains will join the 100 mph queues to and from London. Extra trains North of Ipswich, will use additional Class 755 trains, shuttling up and down the East Suffolk Line. As the Class 755 trains and the express Class 745 trains on London-Ipswich-Norwich services will share the same team of drivers, it is an efficient use of bi-mode trains to extend an electric network. Several of the proposed electrification schemes in the UK in addition to allowing electric trains, will also open up new routes for bi-mode and tri-mode trains. Stirling to Perth electrification would allow bi-mode trains to run between Glasgow and Aberdeen via Dundee. Leeds to York electrification would improve TransPennine bi-mode performance and allow electric trains access to Neville Hill TMD from the East Coast Main Line. Sheffield to Clay Closs electrification for High Speed Two would also improve bi-mode performance on the Midland Main Line. I think it should be born in mind, that the rolling out of the Class 800 trains all over the GWR, seems to have generated few bad reports, after a few initial problems. In Thoughts On The Introduction Of Class 800 Trains On The Great Western Railway, I came to this conclusion. There’s nothing much wrong operationally or passenger-wise with the Class 800 trains, that will not be put right by minor adjustments in the next couple of years. So perhaps extending an electric network with quality bi-mode trains works well. Used creatively bi-mode trains will increase the return on the money invested in electrification. I first saw tram-trains in Kassel in 2015 and I wrote about them in The Trams And Tram-Trains Of Kassel. We are now embracing this technology in a trial in Sheffield using new Class 399 tram-trains. I believe that, the UK is fertile territory for this technology. KeolisAmey Wales haven’t waited for the results of the Sheffield trial and have already ordered thirty-six tram-trains with batteries for the South Wales Metro. It also looks as if the West Midlands are planning to use the technology on an extension of the Midland Metro to Brierley Hill. Glasgow are investigating a tram-train route to Glasgow Airport. Although Network Rail and the Department for Transport seem to be only lukewarm on the technology, it does appear that local interests are much more enthusiastic. In my view, the South Wales Metro is going to be a game changer, as it uses existing tracks, virtually standard tram-trains, electric/diesel/battery trains and a modicum of street running to transform a city’s transport system. I have read that the electro-diesel Class 88 locomotive can change between electric and diesel modes at line speed. As a Control Engineer, I don’t believe it would be an impossible problem for a train powered by a mixture of 25 KVAC overhead electrification and diesel, battery, hydrogen or some other fuel to raise and lower a pantograph efficiently, to take advantage of any overhead wires that exist. The raising and lowering could even be GPS controlled and totally automatic, with the driver just monitoring. In Novel Solution Cuts Cardiff Bridge Wiring Cost, I wrote about how two simple techniques; an insulating coating and surge arresters, saved about ten million pounds, by avoiding a bridge reconstruction. How much can be saved on electrification schemes by using simple and proven techniques like these? A lot of the UK’s railways are like long Victorian buildings. If you’ve ever tried to renovate a cottage that was built around the middle of the nineteenth century, you will understand the following. It is unlikely you will have any accurate plans. Some of the construction will be very good, but other parts will be downright shoddy. You have no idea of the quality of the foundations. If the building is Listed you’ll have a whole new level of bureaucracy to deal with. Now scale your problems up to say a ten mile stretch of rail line, that needs to be electrified. Instead of dealing with a cottage-sized plot, you may now be dealing with the following. A double track railway with four train per hour (tph) in both directions. A site that is several miles long. Access to the work-site could be difficult. So just surveying what has to be done and making sure you have details on any unforeseen underground structures like sewers, gas and water mains and old mine workings, can be a major undertaking. Reading local newspaper reports on the Gospel Oak to Barking electrification, you get the impression the following happened. Various overhead gantries were built to the wrong size. A sewer was found, that had been missed by surveyors. It was wrongly thought that the bridge at Crouch Hill station had sufficient clearance for the electrification. So much more work had to be done. At least there weren’t any mine workings in East London, but as you can imagine these are a major problem in areas in the North. Surely, nearly twenty years into the 21st century, we can avoid problems like these. Low bridges and and other structures crossing the tracks, can be a big and expensive problem, when it comes to electrifying railway lines. In the proposed electrification of the lines for the South Wales Metro, look at these statistics. A total of 172 km. of track will be electrified. Fifty-six structures were identified as needing to be raised. The cost savings of eliminating some of this bridge raising would not be small. In the July 2018 Edition of Modern Railways, there is an article entitled KeolisAmey Wins Welsh Franchise. This is said about the electrification on the South Wales Metro. KeolisAmey has opted to use continuous overhead line equipment but discontinuous power on the Core Valley Lnes (CVL), meaning isolated OLE will be installed under bridges. On reaching a permanently earthed section, trains will automatically switch from 25 KVAC overhead to on-board battery supply, but the pantograph will remain in contact with the overhead cable, ready to collect power after the section. The company believes this method of reducing costly and disruptive engineering works could revive the business cases of cancelled electrification schemes. Hopes of having money left over for other schemes rest partly on this choice of technology. In the final design, KeolisAmey have been able to use this discontinuous power solution at all but one of the fifty-six structures. These structures will be checked and refurbished as required, but they would be unlikely to need lengthy closures, which would disrupt traffic, cyclists and walkers. Each structure would need a bespoke structure to create a rail or wire on which the pantograph, would ride from one side of the structure to the other. But installing these would be a task of a much smaller magnitude. There must be a lot of scope for both cost and time savings. I think in the future, when it comes to electrifying existing lines, I think we’ll increasing see, this type of discontinuous electrification used to avoid rebuilding a structurally-sound bridge or structure. I also think, that experience will give engineers a more extensive library of solutions. Hopefully, costs could be driven downwards, instead of spiralling upwards! In recent years two major electric rail projects have been planned, which have gone much further than the old philosophy of just putting up wires and a adding fleet of new trains. I believe that the Crossrail Class 345 trains and the tunnel under London were designed to be complimentary to each other to improve operation and safety and cut operating costs. But the interesting project is the South Wales Metro, where discontinuous electrification and battery power have been used to design, what should be a world-class metro at an affordable cost. Too many electrification schemes have been designed by dull people, who don’t appreciate the developments that are happening. UK railways are doing better on electrification than many think. These are ideas I’ve seen talked about or are my own speculation. New third rail electrification is not installed much these days, due to perceived safety problems. I have seen it proposed by respected commentators, that third rail electrification could play a part in the charging of train batteries. Discontinuous third-rail electrification is already used extensively, at places like level crossings and where a safe route is needed for staff to cross the line. But it is done in a crude manner, where the contact shoes on the train run up and down the sloping ends of the third rail. As a time-expired Control Engineer, I’m fairly sure that a much better, safer system can be designed. On the South Wales Metro, where discontinuous overhead electrification is to be used, battery power will be used to bridge the gaps. Supposing trains on a third-rail electrified route, were fitted with batteries that gave the train a range of say two kilometres. This would give sufficient range to recover a train, where the power failed to a safe evacuation point. The range on battery power would mean that there could be substantial gaps between sections of electrification, which would be sized to maximise safety, operational efficiency and minimise energy use. Each section of electrification would only be switched on, when a train was present. Train drivers could also have an emergency system to cut the power in a particular section, if they saw anything untoward, such as graffiti artists on the line. When you consider that trains often spend fifteen or twenty minutes at a terminal station, it could make it easier to run electric or bi-mode trains with batteries on branch lines. The rail would normally be switched off and would only be switched on, when a train was above and connected to the rail. As a time-expired Control Engineer, I’m fairly sure that a safe system can be designed. To some overhead electrification gantries on top of a high viaduct are an unnecessary eyesore. 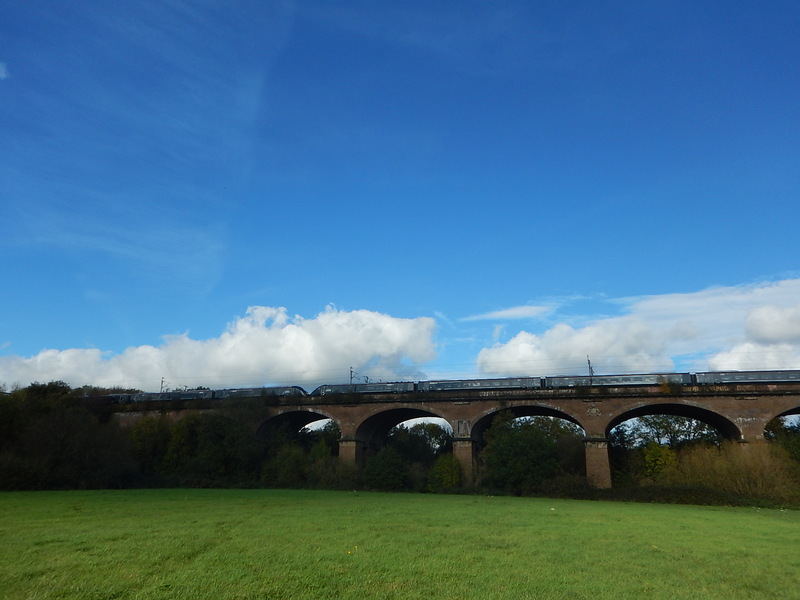 So why not use third-rail electrification, on top of viaducts like these? Trains would need to be able to swap efficiently and reliably between modes. For a country with no really high mountains, we have quite a few railways, that have the following characteristics. A height difference of perhaps two hundred metres. All are in areas, where putting up overhead gantries may be challenging and opposed by some campaigners. As an example consider the Manchester to Buxton route. The height difference is 220 metres. One of Northern’s Class 319 trains weighs 140.3 tonnes. These trains have a capacity of around 320 passengers. If each passenger weighs 90 Kg with baggage, bikes and buggies, this gives a train weight of 167.3 tonnes. These figures mean that just over 100 kWh of electricity would be needed to raise the train to Buxton. Coming down the hill, a full train would convert the height and weight into kinetic energy, which would need to be absorbed by the brakes. Only small amounts of new energy would need to be applied to nudge the train onto the hill towards Manchester. The brakes on trains working these routes must take a severe hammering. Supposing, we take a modern train with these characteristics. 200 kWh of battery capacity to handle regenerative braking. Such a train would not be a difficult design and I suspect that Bombardier may already have designed an Aventra with these characteristics. Only the uphill line would be electrified and operation would be as follows. Climbing to Buxton, the train would use power from the electrification. On the climb, the train could also use some battery power for efficiency reasons. The train would arrive at Buxton with enough power left in the batteries to provide hotel power in the stop at Buxton and nudge the train down the hill. On the descent, regenerative braking would be used to slow the train, with the energy created being stored in the batteries. On the level run to Manchester, battery power could be used, rather than electrification power to increase efficiency. How efficient would that be, with respect to the use of electricity? I would also investigate the use of intelligent third-rail electrification, to minimise visual impact and the need to raise any bridges or structures over the line. Gravity is free and reliable, so why not use it? Without taking great risks, there are lots of ideas out there that will help to electrify routes in an affordable manner. I very much feel we’ll be seeing more electrification in the next few years. What Is The Battery Size On A Tri-Mode Stadler Flirt? The power-pack in the middle of a Tri-Mode Stadler Flirt, would appear to have four slots, each of which could take. A V8 16-litre Deutz diesel that can produce 478 kW and weighs 1.3 tonnes. A battery of about 120 kWh, which would probably weigh about 1.2 tonnes. Would future versions of these trains accept a hydrogen fuel cell? Note that, I estimated the battery size, by using typical battery energy densities for a battery of similar weight and physical size to the diesel engine. In this post, I will assume that a tri-mode train is capable of the following. Running using 25 KVAC overhead and/or 750 VDC third-rail electrification. Running using an on-board power source, such as diesel, hydrogen or Aunt Esme’s extra-strong knicker elastic. Running using stored energy for a reasonable distance. I would suggest that a reasonable distance for battery power would include routes such as. Preferably, the trains should be able to go out and back. What we know about the Stadler Flirt Tri-Mode has been pieced together from various sources. The tri-mode trains for South Wales and the Class 755 trains for East Anglia use the same picture as I pointed out in Every Pair Of Pictures Tell A Story. This leads me to surmise that the two trains are based on the same basic train. Three or four passenger cars. A power-pack in the middle with up to four Deutz 16 litre V8 diesel engines. 25 KVAC overhead electrification capability. This is a visualisation of the formation of the trains clipped from Wikipedia. One of the routes, on which Greater Anglia will be using the trains will be between Lowestoft and Liverpool Street, which shows the versatility of these trains. They will be equally at home on the rural East Suffolk Line with its numerous stops and 55 mph operating speed, as on the Great Eastern Main Line with its 100 mph operating speed. South of Ipswich, the diesel engines will be passengers, except for when the catenary gets damaged. In Tri-Mode Stadler Flirts, I said this. I would expect that these trains are very similar to the bi-mode Stadler Flirt DEMUs, but that the power-pack would also contain a battery. As an Electrical and Control Engineer, I wouldn’t be surprised that the power-pack, which accepts up to four Deutz diesel engines, can replace one or two of these with battery modules. This could make conversion between the two types of Flirt, just a matter of swapping a diesel module for a battery one or vice-versa. Note that the three-car Class 755 trains for Greater Anglia have two diesel engines and the four-car trains have four engines. This is said about the Stadler Tri-Mode Flirts on the South Wales Metro. The units will be able to run for 40 miles between charging, thanks to their three large batteries. So could it be that the tri-mode Stadler Flirts have three batteries and just one diesel engine in the four slots in the power-pack in the middle of the train? In the July 2018 Edition of Modern Railways, there is an article entitled Bi-Mode Aventra Details Revealed. As is typical with Bombardier interviews, they give their objectives, rather than how they aim to achieve them. In Bombardier Bi-Mode Aventra To Feature Battery Power, I said this. Very little more can be gleaned from the later Modern Railways article. Would they say anything else? But Bombardier have claimed in several articles, that the Aventra has been designed in response to what operators and passengers want. The Modern Railways article gives this quote from Des McKeon of Bombardier. From the start we wanted to create a bi-mode which would tick all the boxes for the Department of Transport and bidders. That means a true 125 mph top speed and acceleration which is equally good in both electric and diesel modes. We have come up with a cracking design which meets these criteria. I also think it is reasonable to assume that the performance of the proposed trains is very similar or better to that of Bombardier’s Class 222 train, which currently run on the Midland Main Line. After all, you won’t want times between London and the East Midlands to be longer. Distributed power is confirmed in the Modern Railways article, by this statwment from Des McKeon of Bombardier. The concept involves underfloor diesel engines using distributed power. But distributed power is inherent in the Aventra design with the Class 345 trains. I found this snippet on the Internet which gives the formation of the nine-car trains. When operating as nine-car trains, the Class 345 trains will have two Driving Motor Standard Opens (DMSO), two Pantograph Motor Standard Opens (PMSO), four Motor Standard Opens (MSO) and one Trailer Standard Open (TSO). They will be formed as DMSO+PMSO+MSO+MSO+TSO+MSO+MSO+PMSO+DMSO. Eight cars are motored and only one is a trailer. The snippet has a date of August 13th, 2016, so it could be out of date. It would also appear that the Class 720 trains for Greater Anglia, which are built to cruise at 100 mph, do not have any trailer cars. It will be interesting to observe the formation of the Class 710 trains, when they start running in the autumn. Surely to have all these traction motors in each car must be expensive, but it must give advantages. Perhaps, each motored car has a battery to handle the regenerative braking. This would minimise the power passed between cars, which must be energy efficient for a start. An MS1 car for a Class 345 train weighs 36.47 tonnes. A typical car can accommodate a total of about 175 seated and standing passengers. With bags, buggies and other things passengers bring on, let’s assume an average passenger weight of 90 kg, this gives an extra 15.75 tonnes. So I will assume that an in service MS1 car weighs 53.2 tonnes. Calculating the kinetic energy of the car for various speeds gives. Considering that the Bombardier Primove 50 kWh battery, which is built to power trams and trains, has the following characteristics. A weight of under a tonne. Dimensions of under two x one x half metres. The height is the smallest dimension, which must help installation under the train floor or on the roof. I don’t think Bombardier would have trouble finding a battery to handle the regenerative braking for each car and fit it somewhere convenient in the car. Underneath would be my position, as it is closest to the traction motors. So just as traction is distributed, could the batteries and diesel power be distributed along the train. The full statement about what Des McKeon said, that I used earlier is as follows. The concept involves underfloor diesel engines using distributed power, but that designing from scratch enabled Bombardier to fit these without having to substantially raise the saloon floor height on any of the vehicles. When asked about which diesel engines would be used, Mr. McKeon also confirmed that there were at least two potential suppliers, and that the diesel engines fitted would comply with the latest and highest emissions standards. Conversion to pure electric operation is also a key design feature, with the ability to remove the diesel engines and fuel tanks at a later date, if they were no longer required. One of my customers fror data analysis software, was Cummins, who have supplied Bombardier with diesel engines in the past. One thing that impressed me, was that they have an ability to reposition all the ancillaries on a diesel engine, so that, if required for a particular application, it could be fitted into a confined space. I believe from what I saw, that Cummins or one of the other diesel engine manufacturers could supply a low-height diesel engine with an adequate power level to fit under the car floor without raising it by an unacceptable amount. If you travel on one of London’s New Routemaster buses and sit in the back seat downstairs, at times you can just about hear the diesel engine, which is placed under and halfway-up the stairs, as it starts and stops. But generally, the engine isn’t audible. A typical Volvo double-decker bus like a B5TL, is powered by a 5.1 litre D5K-240 engine, which is rated at 240 bhp/177 kW. By contrast, the New Routemaster is powered by a Cummins ISBe engine with a capacity of 4.5 litres and a rating of 185 bhp/138 kW. One of the major uses of a larger 5.9 litre version of this engine is in a Dodge Ram pickup. The two buses do a similar job, but the New Routemaster uses twenty percent less power. The saving is probably explained because the New Routemaster is effectively a battery bus with regenerative braking and a diesel engine to charge the battery. I am led to the conclusion, that Bombardier plan to fit an appropriately sized diesel engine under the floor of each car in the train. Bombardier built the 125 mph Class 222 train, which have a 19-litre Cummins QSK19 engine rated at 750 bhp/560 kW, in each car of the train. I can’t find the weight of a car of a Class 222 train, but that for a similar 220 train is around 46.4 tonne, of which 1.9 tonnes is the diesel engine. Applying the same logic, I can calculate the energy for a single-car of a Class 222 train. A typical car weighs 46.4 tonnes. A typical car can accommodate a total of about 75 seated and standing passengers. With bags, buggies and other things passengers bring on, let’s assume an average passenger weight of 90 kg, this gives an extra 6.75 tonnes. So I will assume that an in service car weighs 53.2 tonnes. Remarkably, the weight of the two cars is the same. But then the Aventra has more passengers and a heavy battery and the Class 22 train has a heavy diesel engine. As both trains have the same FLexx-Eco bogies, perhaps the car weight is determined by the optimum weight the bogies can carry. Calculating the kinetic energy of the car for various speeds gives, these figures for a single car of a Class 222 train. I will also adjust the figures for the proposed high speed bi-mode Aventra, by adding an extra tonne to the weight for the diesel engine and fuel tank. This gives the following figures for a tri-mode 125 mph Aeventra. Note that increase in speed is much more significant, than any increase in weight of the car, in determining the car energy. I will now look at how the high speed bi-mode Aventra and a Class 222 train, running at 125 mph call at a station and then accelerate back to this speed after completing the stop. The high speed bi-mode Aventra will convert the 23.5 kWh to electrical energy and store it in the battery. After the stop, probably eighty percent of this braking energy could be used to accelerate the train. I m assuming the eighty percent figure, as regenerative braking never recovers all the braking energy. This would mean that to get back to 125 mph, another 5.1 kWh would need to be supplied by the diesel engine. In contrast the diesel engine in the car of the Class 222 train would need to supply the whole 23 kWh. As the time to accelerate both trains to 125 mph will be the same, if Bombardier are to meet their probable objective of similar performance between the following. Bi-mode Aventra in diesel mode. This means that the size of diesel engine required in the bi-mode Aventra’s diesel in each car is given by. 560 * 5.1/23 = 124 kW or 166 bhp. Could we really be seeing a 125 mph bi-mode train powered by a posse of Amrican pick-up truck engines? The mathematics say it is possible. If you think, I’m wrong feel free to check my calculations! The Modern Railways article, also says this about last mile operation. The option for last-mile operation or for using this technology through short sections, such as stations will also be available, although Mr. McKeon said this is not in the core design. I think there is more to this than than in the words. The South Wales Metro is making extensive use of discontinuous electrification to avoid the need to raise bridges and other structures. I said more in More On Discontinuous Electrification In South Wales. The ability to run on a few hundred metres of overhead rail or wire, without any power would be very useful and allow electrification to be simplified. Imagine too a section of line through a Listed station or historic landscape, where electrification would be difficult for heritage reasons. The train might glide silently through on battery power, after lowering the pantograph automatically. It would raise automatically, when the electrification was reached on the other side. And then there’s all the depot and stabling advantages, of using batterry power to cut the amount of electrification and improve safety. The Modern Railways article, also says this about future fuels. Mr McKeon said his view was that the diesel engines will be required for many years, as other power sources do not yet have the required power or efficiency to support inter-city operation at high speeds. Running at high speeds in itself is not the problem, as a train with good aerodynamics and running gear will run easily without too many losses due to friction. The biggest use of traction energy will be accelerating the train up to operating speed after each stop. It is too early yet to judge whether fuels like hydrogen will be successful, but other areas will improve and make trains more efficient. Better batteries with a higher energy storage per kilogram of battery weight. More efficient, quieter and less polluting diesel engines. More intelligent control systems for the train and to inform and assist the driver. I also think there is scope for electrifying sections of track, where energy use is high. The Modern Railways article finishes with this paragraph. In terms of the interior, Mr. Mckeon said the aim was to offer passenger comfort to match that on an EMU. The key elements of this are to have less vibration, less noise and an even floor throughout the passenger interior. I believe my calculations have shown that using batteries to handle regenerative braking, substantially reduces the size of the diesel engines required, to about that of those in a serial hybrid bus, like a New Routemaster. These smaller engines are much quieter, with much less noise and vibration.Their smaller size will also make designing a train with a uniform even floor a lot easier. The maximum operating speed of the two trains is as follows. This would appear to be a point to Bombardier. But could the speed of the tri-mode Stadler Flirt be increased? 125 mph Flirt EMUs do exist, but these don’t have the power pack in the middle, which may have the capability to introduce unwelcome dynamics into the train. On the other hand, the high speed bi-mode Aventra, is dynamically at least, very much a conventional non-tilting high speed train., even if the way the train is powered is unconventional. UK high speed trains have generally been capable of greater than 125 mph. The InterCity 125 set the world record for a diesel train at 148 mph, on the first of November 1987. The InterCity 225 was designed to run at 140 mph (225 kph) with in-cab signalling. In 1989, one train achieved 161 mph. Class 395 trains regularly run at 140 mph on HS1 and have run at 157 mph. Class 800, Class 801 and Class 802 trains are all designed to run at 140 mph with in-cab signalling. I can’t help thinking that Bombardier’s engineers know a way of obtaining 140 mph out of their creation. Calculation shows that the kinetic energy of one car of a high speed bi-mode Aventra travelling at 140 mph is 30 kWh, which is still easy to handle, in a train with a battery and a diesel engine in each car. Could this train be the ideal classic-compatible train for High Speed 2? I said earlier that the range of the Tri-Mode Stadler Flirt will be forty miles on batteries. I speculated that these trains are formed of cars with a 50 kWh battery and a small diesel engine of about 124 kW in each car. So the range could be somewhere between 10 and 17 miles. But the more efficient the train, the greater the distance. Reducing energy consumption to 2 kWh per vehicle mile would give a range of 25 miles. Adding more cars to an Aventra appears to be fairly easy, as these trains can certainly be ten-car units. But doing this to a Tri-Mode Stadler Flirt may be more difficult due to the train’s design. Five or possibly six cars might be the limit. I wonder how much energy storage you get for the weight of a V8 diesel, as used on a bi-mode Flirt? The V8 16 litre diesel engines are made by Deutz and from their web site, it looks like they weigh about 1.3 tonnes. So how much energy could a 1.3 tonne battery store. The best traction batteries can probably store 0.1 kWh per kilogram. Assuming that the usable battery weight is 1.2 tonnes, then each battery module could store 120 kWh or 360 kWh if there are three of them. How Far Would A Full 360 kWh Battery Take A Three-Car Flirt? In an article in the October 2017 Edition of Modern Railways, which is entitled Celling England By The Pound, Ian Walmsley says this in relation to trains running on the Uckfield Branch, which probably has a terrain not much different to the lines to the South and West of Cardiff. This would mean that a 360 kWh battery would take a three-car train between twenty-four and forty miles. The claim in Modern Railways of a forty mile range, isn’t that out of line. How Much Energy Is Needed To Raise A Three-Car Flirt From Ystrad Mynach To Rhymney? In Tri-Mode Stadler Flirts, I estimated the following about the weight of three-car Flirt. I reckon, that the weight of the train will be around 130 tonnes. I will assume 150 passengers at 80 Kg. each, which gives a weight of 12 tonnes. Raising it through the 125 metres between Ystrad Mynach and Rhymney, will need 48 kWh. But what about stopping and starting at the seven stations on the route? At every stop, a proportion of the energy will be recovered. If 20% is lost at every station, I think we can add about another 20 kWh of energy use. three-cars x 10 miles x 3kWh and three-cars x 10 miles x 5 kWh or between 90 kWh and 150 kWh. It would appear there is certainly enough power from a full battery, that will have been charged all the way from Cardiff to drive a three-car Flirt up to Rhymney on battery power. For a four-car train my weight estimate is 166 tonnes, which means Raising the train between Ystrad Mynach and Rhymney, will need 57 kWh. Train running power would be between 120 kWh and 200 kWh. It would still be possible to go between Ystrad Mynach and Rhymney on battery power. It looks to me, that Stadler have designed a tri-mode train on steroids! This is said about the additional double track on the South Wales Metro. Additional double track will be needed in 15 locations to support increased Core Valley Lines (CVL) frequencies. So where are these locations? I shall start by listing all the single platform stations. I have ignored the following. Stations on the Coryton Line. I have grouped them by branch. These total up to fourteen stations. As the Butetown Branch will be extended through Cardiff Bay station and this station will need a second platform, does this add up to the fifteen new sections of double-track? How Difficult Will It Be To Add A Second Track At Stations? Of the fifteen stations, those on the Aberdate, Merthyr and Rhondda will only see the Stadler Citylink Metro vehicles, which will be running to the same rules as trams. So could it be that these stations will be arranged like this stop on the London Tramlink, which is typical of many tram stops throughout the UK, Europe and the world? There is full step-free access. The overhead wires are kept well out of thew way. As most tram networks have done in the UK, they could design a modern suite of shelters, ticket machines, information displays, seats help points and other items. I suspect that the platform height would be designed to fit both the tri-mode Stadler Flirts and the Stadler Citylink Metro Vehicles. The only stations that are served exclusively by the tri-mode Stadler Flirts and might be given an extra track are Pontlottyn and Brithdir stations at the Northern end of the Rhymney Line. These stations only get four tph in both directions. Do Many Stations Have Passing Freight Trains? I never like to be on a platform, when a freight train goes through and it happens regularly at stations near me like Canonbury and Dalston Kingsland. I suspect too, that they could use temporal separation, with any freight trains ruining, when the Metro is closed. I do find it strange that the total number of one platform stations is the same as the number of locations, where the track will be doubled. But surely, if all stations were on a double-track, this would give the maximum flexibility to run services. If too, the stations could be built without footbridges to the standards of trams, then construction costs could be saved! The system is used elsewhere, but not in the UK. Disruptive engineering works will be avoided on fifty-five structures. Between Radyr and Ninian Park stations is also proposed for electrification. Nothing is said about only electrifying the uphill track, which surely could be a way of reducing costs. The article also states that on the Rhymney Line, the section between Ystrad Mynach and Rhymney stations will be run on batteries. The distance is about ten miles. The altitude difference is is about 125 metres. The station area at Rhymney station will be electrified. Rhymney will be an overnight stabling point. Trains will change between overhead and battery power in Ystrad Mynach station. Trains could charge the batteries at Rhymney if required. Effectively, there is a avoidance of at least fourteen miles of electrification. Four miles of double track between Ystrad Mynach and Bargoed. Six miles of single track between Bargoed and Rhymney. But as Rhymney to Ystrad Mynach currently takes about fourteen minutes, there will have to be some extra double-track, so that the required frequency of four trains per hour (tph) can be achieved. None of this extra track will need electrification. As the trains working the Rhymney Line will be tri-mode Stadler Flirts, with the capability of running on electricity, diesel or battery, I don’t think that KeolisAmey are taking any risks. The Merthyr Line splits North of Abercynon station into two branches to Aberdare and Merthyr Tydfil stations. South of Abercynon the branch is double-track. Both branches are single track. The Aberdare branch is about eight miles long. Aberdare is around 40 metres higher than Abercynon. Trains take 27 minutes to climb between Abercynon and Aberdare stations and 21 minutes to come down. Merthyr Tydfil is around 80 metres higher than Abercynon. Trains take 27 minutes to climb between Abercynon and Merthyr Tydfil stations and 21 minutes to come down. 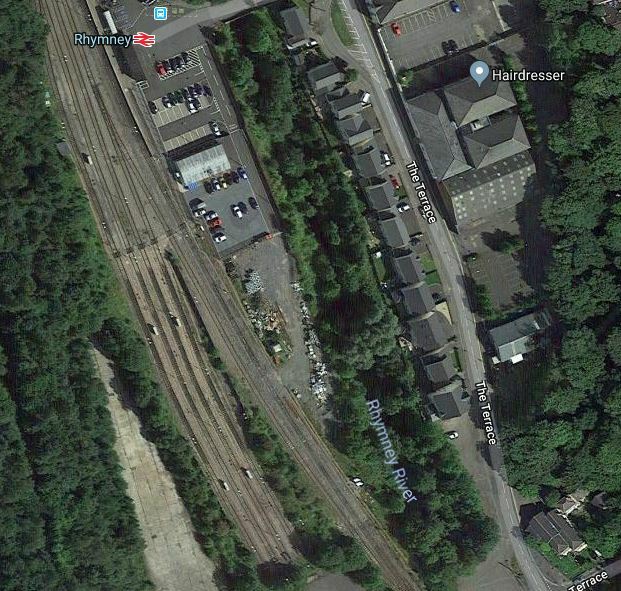 If the proposed four tph are to be run on these branches, there would need to be some double-tracking North of Abercynon. Will both tracks be electrified, or will it be possible with just electrifying the uphill track? The Rhondda Line splits from the Merthyr Line to the North of Pontypridd station and goes North to Treherbert station. South of Porth station, the line is double-track. North of Porth station, the line is single-track with a passing loop at Ystrad Rhondda station. Treherbert is 90 metres higher than Porth.. Trains take 28 minutes to climb between Porth and Treherbert and 20 minutes to come down. If the proposed four tph are to be run on this branch, there may need to be some double-tracking North of Porth. I suspect there’ll be more savings, as the engineers get to grips with the capabilities of battery trains and discontinuous electrification. As I said, will it be necessary to electrify downhill tracks? The tri-mode Stadler Flirts and the Stadler Citylink Metro vehicles could use regenerative braking to their batteries. The use of gravity in this way to charge the batteries, would increase the efficiency of the South Wales Metro. The title of this post, is the same as that of this article on Walesonline. The interesting part is the holistic thinking, where a new depot is to be built at Taff’s Well, where the station is also to be modernised, with the addition of a Park-and-Ride. Taff’s Well station is a very outdated affair, as these pictures show. The station could certainly do with a new step-free bridge. Six tph will go to The Flourish. There will also be a new two tph service on the City Line. All trains will be new Stadler Citylink Metro Vehicles. That Park-and-Ride will certainly be needed. As Taff’s Well station will be at the heart of the tram-train network, it is most certainly a good place for the depot. The article also says that enhanced stabling facilities will be built at Treherbert and Rhymney stations. Rhymney station is the terminal of the Rhymney Line. These are my pictures of the station. This Google Map gives an aerial view. In addition to the enhanced stabling, the station will also be upgraded to accommodate more and longer Tri-Mode Stadler Flirts. There’s certainly a lot of space for the stabling. Treherbert station is the terminal of the Rhondda Line. I took these pictures of the station in 2014. This Google Map shows an gives view. There certainly would appear to be space for the enhanced stabling. Caerphilly station is an important one on the South Wales Metro. In 2023, the service will be upgraded. Two tph between Barry Island and Rhymney stations via Cardiff Central. Two tph between Penarth and Caerphilly stations via Cardiff Central. In 2023, the service will be three minutes quicker to and from Cardiff. In addition, note the following about Caerphilly station. The station is on the Rhymney Line, which will be worked by Tri-Mode Stadler Flirts. The station lies just to the North of the Caerphilly Tunnel, which is not being electrified and trains are expected to transit using battery power. The station has a bay platform. The station appears to be a hub for buses. The long bay platform on the North side of the station. It may be long enough to accommodate two of the Tri-Mode Stradler Flirts, which are 65/80 metres long. This means that the bay platform could be very valuable for service recovery. The station serves as a Park-and-Ride. Three structures cross the track, which from the left are the old station buildings, the station footbridge and a footbridge independent from the station. Looking at the track layout on the Eastern approach to the station, the cross-overs are within fifty metres of the platform end. These are my thoughts on various issues. I think there would be serious issues with standards for electrification at this station. The three structures will have to be handled in the way I described in How Can Discontinuous Electrification Be Handled? 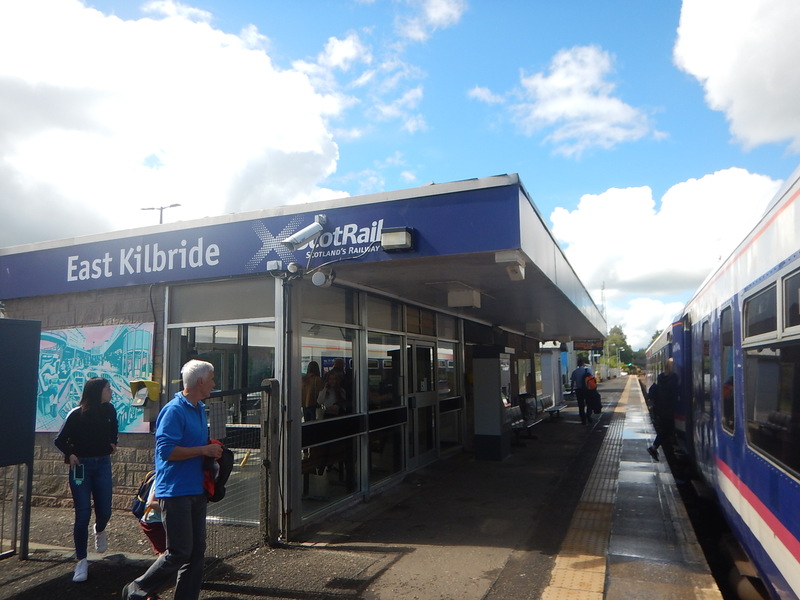 The old station building is integral with a road bridge and would be a costly and very disruptive operation to replace. So if the structure will safely last a hundred years or so and the wires can be squeezed underneath using discontinuous methods, everybody wins. The Easternmost bridge at the far end of the platforms looks to be a fairly recent structure and is independent of the station, as it just gives pedestrians a route across the railway. It might even have been built, when the bay platform was built a few years ago. So that leaves the elderly footbridge, which probably dates from 1871, when the station was moved to its present position. It is the main way that passengers cross the line and given that Caerphilly station has nearly a million passengers a year, it would be classed by disabled activists as a disgrace. A few stations up the line, lifts were added to the footbridge at Ystrad Mynach station, in conjunction with other works. Wikipedia says this. In 2014, the station underwent a £1.6 million refurbishment with new ticket machines, waiting areas and ticket office, with disabled toilet being installed in addition to major work carried out on the footbridge with lifts being installed to improve accessibility. Surely some of the money saved on electrification could be spent on improving access? 25 KVAC wires have to be several metres away from any staff and passengers. The Northbound Platform 3 is wide and if the overhead wire can be suspended high enough, I suspect that the latest regulations can be met. The Southbound Platform 2 is narrower and the platform has a low roof, which might mean electrification is trickier. But if as I suspect, battery power and gravity will be used to power the trains on the downhill track, then there could be a case for leaving the downhill track without wires. That could save half the costs on some sections of the route. On a railway with full electrification all crossovers must be electrified.. But on the Rhymney Line, all the trains will be Swiss all-purpose trains, that can work on all power sources, probably including cuckoo-clock motors. So imagine a Tri-Mode Stadler Flirt arriving from Penarth, which will be turning back in the bay platform at Caerphilly. It would use the electrification between the unelectrified Caerphilly Tunnel to just before the crossover to come up the hill and probably add some charge to the batteries, that have been depleted in the run through the mile-long tunnel. \\\the train would probably rate at a signal just before the crossover, until told to proceed by the signalling system. The pantograph will be dropped and the train switched to battery or diesel power. When giving the green by the signal, the train would move into the bay platform. All done efficiently and safely without any electrification, which would not be installed on the crossover or in the bay platform. There will have to be a plan for handling train failures in the tunnel. I suspect that as Switzerland has lots of railways in the mountains, some with extensive tunnels, that the Swiss have pretty good methods for dealing with failures. Trains are generally designed, so that a second train can rescue a failed train of the same class or even a similar type. This makes good sense, as a train operator generally has several trains of the same type and their Thunderbird locomotive may be working miles away. I’m sure that the Tri-Mode Stadler Flirts will have this capability. If a train should fail in the Caerphilly tunnel on the downhill track, a second train would probably couple up and shepherd the train slowly down the hill to the depot at Canton. If a train should fail in the Caerphilly tunnel on the downhill track, a second train would probably couple up and push the stricken train into the bay platform at Caerphilly station. The more I look at the South Wales Metro, it has been designed in an holistic manner with routes, tracks, electrification, stations and trains all designed to work together. Cardiff Queen Street station is the first station to be refurbished for the proposed South Wales Metro. The station is fully step-free. The platforms are wide, which helps interchange or waiting for your destination. See Canada Water on the Overground and St. Pancras on Thameslink. Currently, to get to Cardiff Bay station, you need to catch a five trains per hour (tph) shuttle train from Platform 1. The service pattern is fairly-straight-forward, with the following lines passing though the station from South to North. 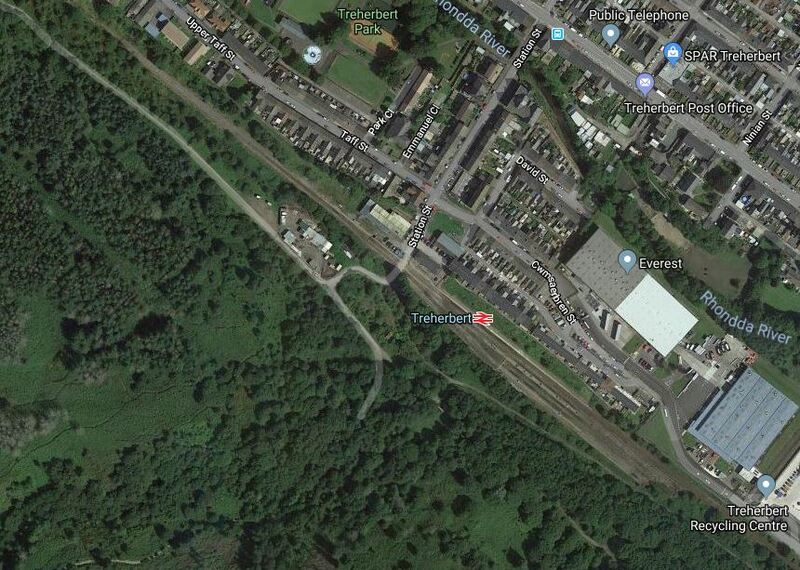 2 tph – Coryton Line between Radyr and Coryton stations via Cardiff Central. 2 tph – Cynon Line between Barry Island and Aberdare stations via Cardiff Central. 2 tph – Rhondda Line between Cardiff Central and Treherbert stations. 3 tph – Rhymney Line between Cardiff Central and Bargoed stations. 1 tph – Rhymney Line between Penarth and Rhymney stations via Cardiff Central. 2 tph – Taff Line between Cardiff Central and Merthyr Tydfil stations. It is said, that to build anything, you need good foundations. These services through Cardiff Queen Street station, seem to be a good foundation for the South Wales Metro. The current proposed services through the station after the Metro is completed are. 2 tph – Cynon and Taff Lines between Aberdate and Merthyr Tydfil stations via the City Line and Cardiff Central – Stadler Citylink Metro Vehicles. Summarising services gives these figures. 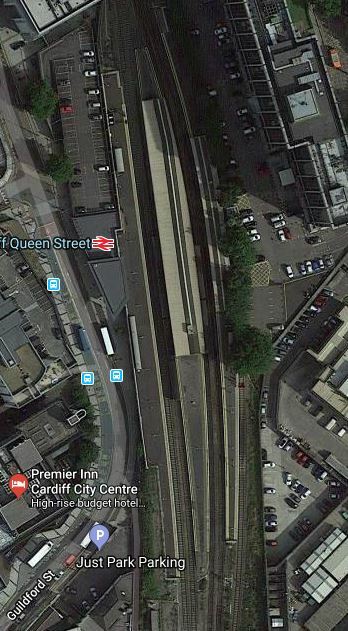 This Google Map shows Cardiff Queen Street station. The bay platform, which is numbered 1, is in the South East corner of the station. is used for services to Cardiff Bay station. There is no North-facing bay platform. Northbound trains for Aberdare, Merthyr Tydfil and Treherbert share Platform 5. Northbound trains for Bargoed, Coryton and Rhymney share Platform 4. Sounthbound trains use Platforms 2 and 3. I believe that this layout will be changed in the creation of the South Wales Metro. In an ideal world passengers should have a same-platform or cross-platform interchange between services going in the same direction. If services going in the same direction shared the same platform, this would meet sixteen tph using two platforms, as two tph will terminate at Cardiff Queen Street station. Canada Water station on the East London Line of the London Underground in a couple of years will be handling twenty tph. The platforms are wide with escalators, lifts and stairs. Four Southern destinations and Two Northern destinations are served. All services are run by Class 378 trains. Access between train and platform is step free and wheel-chairs and buggies can be pushed across. The East London Line has modern signalling. If Crossrail and Thameslink will be able to handle twenty-four tph with digital signalling, I believe a solution can be found so that sixteen tph can pass through Cardiff Queen Street station. Having seen wide platforms in operation at stations like Canonbury, London Bridge and Whitechapel, I feel an ideal layout at Queen Street station would be to use Platform 3 for all Southbound services and Platform 4 for all Northbound services, with as wide a platform as possible in between. Passengers from Rymney and Coryton needing to go to The Flourish, would get off the train and get a Citylink for The Flourish. Passengers between The Flourish and Cardiff Central would just have to walk across the platform at Queen Street station to change trains. Passengers needing a train to Rhoose Airport could choose to change at Queen Street station. Most waits at Queen Street station would be in a few minutes. Although, passengers would wait longer for Barry Island, Bridgend and Rhoose Airport. There is still the problem about what to do with the two tph that from Treherbert that terminate at Queen Street station. They could use Platform 2 or 5. They could use a new bay platform in the North end of Pltform 3/4. They could go through Queen Street and Central stations to terminate elsewhere. Option 1 would have problems. Every thirty minutes a Citylink would have to cross the busy lines to the North of Queen Street station. Passengers wouldn’t always use the same platform for the Rhondda Line. Passengers wouldn’t have an easy interchange at Queen Street station. Option 2 would be better. The track layout would be similar. Rhondda Line passengers would only have the inconvenience of sometimes walking along the platform. .Even if this option was not used to turn trains, I suspect it could be built, as it would also be useful for service recovery purposes. I like Option 3, although it will have the following consequences. ,The Flourish would need to be able to handle eight tph on the two proposed platforms. Queen Street station would need to be able to handle eighteen tph in both directions. I suspect that both problems are solvable. The problem with Option 4 is where do you turn the two extra trains? I suspect that the Citylink vehicles can only use the City Line after Cardiff Central. Would it be a good idea or not to run four tph on this route? I don’t know! But a personable young station man at Queen Street station, said that handling the football can be a problem. So perhaps more trains going to Ninian Park station might be a good idea. I write about it in detail in The South Wales Metro and Big Events. Cardiff Queen Street station has the possibility to be a World Class Metro interchange.